On the 16th of July, 2018, the members of the Democratic Students Alliance of Manipur (DESAM) conducted a peaceful protest in front of the Raj Bhavan in Manipur. There were around 50 protesters, mostly female students, holding placards and shouting slogans in front of the Raj Bhavan. They were demanding for the removal of the current Vice Chancellor of the Manipur University on grounds of malpractice and negligence. As the admission season draws closer, there was also an urgent demand made for the release of the examination results. This peaceful protest was stopped by the male CRPF personnel deployed at the gate, who pushed and pulled at the traditional bottomwear of the protesting Manipuri girls. This was done without the presence of the women police personnel. After being pushed around, some of the girls were kicked and many had even fallen on the ground. They were not helped by the CRPF personnel. After being chased away from the area, the protest moved to the state headquarters of the BJP party. Once again, they were stopped by the Manipur police commandos and the Manipur police who were stationed at its gates. After a few minutes, here too, a large number of police charged upon the male and female protestors, without the presence of the female police personnel. Only later were the women police personnel called to the scene. Mr. Sital Oinam, the General Secretary of DESAM, was pushed by a Sub-Inspector and another police personnel towards a running 10 tires loaded truck with fuel, knowing full well that it was life threatening. This is suspected to have been done intentionally to suppress the students’ movement. Mr Sital’s left hand was run over by the truck and he also sustained serious fracture on his left arm. On the 17th of July, 2018, another peaceful protest was carried out in front of Kangla Fort by burning effigies and voicing slogans. Soon, a few police personnel made it to the scene of the protest and tried to make the protestors leave. The students then made their way to the Chief Minister’s office and carried on their peaceful protest. The police soon surrounded them, without the presence of female police personnel, and confronted the protestors with a baton. The baton charge by the police in front of the Chief Minister’s office was mostly on the head of the protestors. Having been hit on the head, many of the protesters had symptoms of vomiting and dizziness. There was a masked man wearing a police uniform at the scene, and it is suspected that he was not part of the police personnel, considering his aggressiveness. He could not be stopped by any senior officers either, except one Additional SP. Mr. Sital and the other injured students are being treated at the Raj Medicity. None of the injured students were visited by any Government officials so far. 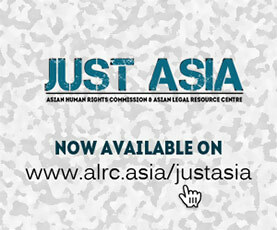 The AHRC calls for the Government’s quick response towards the grievances of the students. There should be greater efforts to tackle the problems faced by the students. The reconstitution of the inquiry committee by the Human Resource Development Ministry to look into the allegations against the Vice-Chancellor is one such effort. The Government of India as well as the state government of Manipur should take stringent action against the CRPF and the police personnel who have assaulted the protestors and mishandled the women protestors and investigate the allegations of sexual assault. It should also be ensured that there are female police personnel also deployed when handling such situations with the public. The law enforcement agencies must use force as the last resort in all matters, especially during times of peaceful protests. Baton charge is an archaic method of suppressing protestors. The students must be given a proper outlet to voice their concerns, their concerns given a patient ear and negotiated without stifling their freedom of peaceful association and assembly. 2. Mr. Baleshwor Philem aged about 24, Member (DESAM). 3. Mr. Sharungbam Umakanta aged about 18, Member (DESAM). 4. Mr. Ngasepam Ajay, aged about 23, Member (DESAM). 5. Mr. Mayengbam Somorjit, aged about 24, Member (DESAM). 6. Ms. Sanasam Joshua, aged about 22, Member (DESAM). 7. Mr. Wangkhem Sanatomba, aged about 18, Member (DESAM). 8. Mr. Nandeibam Omen, aged about 19, Member (DESAM). 9. Mr. M. Ajit Kumar, aged about 25, Member (DESAM). 10. Mr. Leishungbam Rajesh, aged about 24, Member (DESAM). 11. Mr. Thounaojam Ajit, aged about 20, Member (DESAM). 12. Mr. Salam Shyamkumar, aged about 21, Member (DESAM). 13. Ms. Laishram Bidya, aged about 22, Member (DESAM). and 9 others mostly female. 3. Unidentified Mask men wearing police Uniform. Date of incident: 16th and 17th of July, 2018. Place of incident: In front of Raj Bhavan and BJP Head Office and CM Office, Secretariat, Imphal. I am writing to voice my deep concern regarding the information received from the Asian Human Rights Commission (AHRC) and the Youth’s Forum for Protection of Human Rights (YFPHR) about the baton charging by the police personnel of Manipur against student protesters. 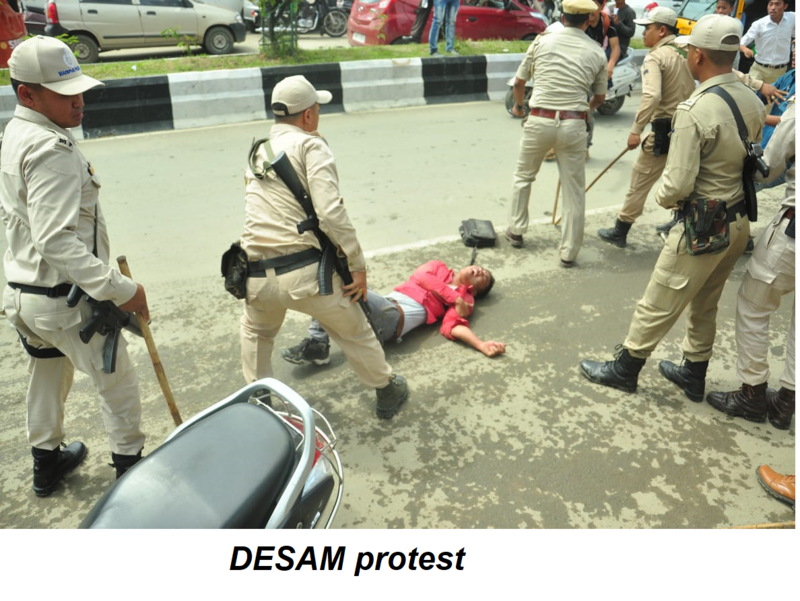 Student members of the Democratic Students Alliance of Manipur (DESAM) protesting for the removal of the Vice Chancellor of Manipur University were not allowed to peacefully conduct their protest and were repeatedly stopped by the police. The police manhandled them, and even assaulted girls. The students have a right to freedom of expression and the freedom to assemble, especially when they have done so peacefully. In the incident in front of the Raj Bhavan in Imphal, girls were pushed and pulled by the CRPF with many falling on the ground after being kicked. The protests in front of the state’s BJP headquarters was also stopped. Amongst the police there was the presence of a masked man who aggressively attacked the protestors. One Mr. Sital Oinam, the General Secretary of DESAM, was pushed by a Sub-inspector and another police personnel, into a running 10 tired loaded truck filled with fuel which could have been life threatening. The truck ran over his left hand and also fractured his left arm. It has also been reported that no Government official has visited any of the injured students so far. I request the Government of India and the state government in Manipur to take due action against the use of unnecessary use of force against civilians, especially students. Strict measures should be taken against those police personnel who have manhandled and aggressively behaved with the students, they should be punished in accordance to the rule of law of the land. The instances of sexual harassment by the police personnel who assaulted the women protesters by pulling at their clothes must be investigated thoroughly. The fundamental rights of citizens of the country must be safeguarded. They should be allowed to exercise their right to freedom of expression and freedom of assembly, this must not be restricted as it is so enshrined in the Constitution of India. The demands of the students must be given a patient ear and negotiated peacefully instead of resorting brute force to stifle dissent.